It’s been fourteen seasons, since a Division I hockey team won back-to–back NCAA titles. Only Three teams have done it during the 2000’s (Minnesota 2002, 2003, Denver 2004, 2005, Minnesota-Duluth 2018, 2019). With their impressive 3-0 victory against UMass on Saturday, the Bulldogs solidified the National Collegiate Hockey Conference as a power conference. This is also the first time since 2005 that a conference has won four NCAA titles in a row. As you can see above, the last conference to win four titles in a row was the WCHA 2002-2005. For the folks that are keeping track at home. In the last eight years, Minnesota-Duluth head coach Scott Sandelin has led the Bulldogs to three NCAA titles; 2011, 2018, 2019. Two of those came with the NCHC. I also like the way that Commissioner Fenton is thinking. Keeping the conference games at 24 gives teams an opportunity to play 10 non-conference games. Ponder this, during their back-to-back title run, UMD hasn’t even been been the best team in the conference. This season, they finished 19 point out of first place. When it’s all said and done, none of that matters. NCHC teams are battle tested when the NCAA playoffs start. On Saturday after beating Colorado College 6-1 in the third-place game of the NCHC’s Frozen Faceoff, a relieved Denver Pioneers head coach David Carle said this. Don’t count on them expanding anytime soon. The league is worried about focusing on the existing eight members. 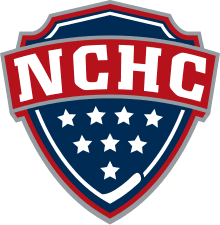 Let’s take a look at what the NCHC, has accomplished in it’s brief six-year history. It’s an impressive resume. During their six-year history twenty-two teams have made the NCAA tourney. Even more remarkable, Denver has made made the tourney every year since the NCHC began conference play. Ten NCHC teams have mad the Frozen Four since the beginning of the NCHC (2013-14). Finally, four teams have won NCAA titles with Minnesota-Duluth repeating in back-to-back seasons. What does the conference do for an encore? In April of 2016, AIC decided to change their program’s trajectory. The college hired AIC Alumnus Eric Lang, to be their program’s ninth head coach. Lang returned to the Yellow Jackets after spending four seasons as an assistant coach with Army Black Knights. With a new head coach and the move to the MassMutual Center, the Yellow Jackets’ hockey program was ready to fly to new heights in Atlantic Hockey and Division I college hockey. That was only just the beginning. During the summer of 2016 American International College announced that their hockey team would be moving into a new 6,866 seat arena, the MassMutual Center in Springfield, Massachusetts. Pre-MassMutual Center, the Yellow Jackets played in the 2,220 seat Olympia Ice Center in West Springfield, Massachusetts. Prior to moving into their new building, the Yellow Jackets would win just 21 times in 111 games. Also, during the fall of 2016, at the Atlantic Hockey’s annual directors meeting, the league announced that it was increasing their scholarship to 18 scholarships, the maximum allowed per the NCAA. Do you see where this is heading? A new building, a new coach, more scholarships. Equals a bigger commitment to college hockey. On Friday, October 14, 2016, when the Yellow Jackets played their first game in their new home against the Union Dutchmen. The Yellow Jackets would lose that game 5-4. During the 2016-17 season, there would be more downs than ups, the Yellow Jackets would finish the season 8-20-8 (.333). The following season, the Yellow Jackets would improve winning seven more games and finish 15-20-4 (.435). It would appear that AIC’s investment in college hockey has finally paid off. This season, the Yellow Jackets went 23-17-1, they went 18-9-1 in AHA play. They won league playoff championship and qualified for their first-ever NCAA tournament bid. 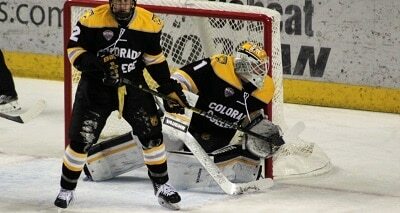 Last Friday, the Yellow Jackets shocked the college hockey world when they upset number one overall seed St. Cloud State 2-1 in the first round of the NCAA West Regional Championship. The Yellow Jackets magical season would end in the West Reginal Finals on Saturday night with a 3-0 loss to the Denver Pioneers. After their first-ever NCAA game, an excited head coach walked the media through their game plan. The Yellow Jackets had a set script and they executed it flawlessly. Moving forward, this past weekend’s NCAA appearance will pay dividends for Lang’s Yellow Jackets. Especially, when it comes to recruiting. ‘I can tell you three years ago when I was making phone calls from a four, five and six-win team, it’s hard to get guys to call you back,” Lang said. “But it’s a little easier if you’re regular season conference champs and when you’re making recruiting phone calls from first place, or we’re squeezing as many phone calls that we could in a 24-hour period from yesterday to today. 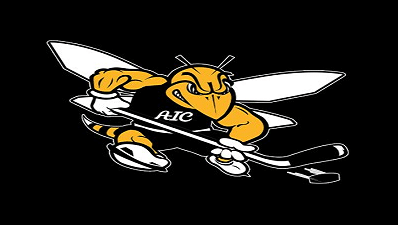 It would appear that the future is very bright for the AIC Yellow Jackets. They showed the college hockey world that they’re going to be a team to be reckoned with in the future. Just ask the SCSU Huskies, they got an introduction last Friday Night. This weekend, the NCAA kicks off the Division I men’s hockey playoffs. Even though the University of North Dakota men’s hockey team isn’t in the NCAA playoffs this season, I will be headed to Fargo, ND, to cover the West Regional Championship. Last week at the Frozen Faceoff, I told a friend, I feel a void (yes, UND has missed the NCAA tourney two years in a row). While our favorite team may not be there, let’s stop and enjoy the moment. It is what it is. Moving forward, I do predict that next season, UND will again make the NCAA tourney. Moreover, I predict that Canisius College will be on the wrong side of two lopsided losses next October. 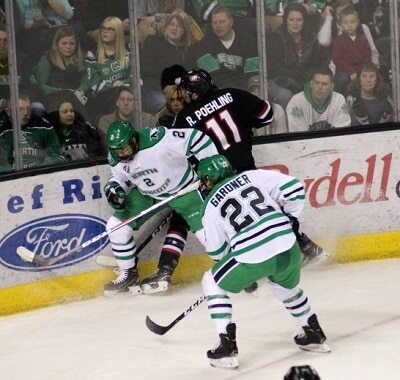 Just two years ago, UND bounced SCSU in the first round of the NCHC playoffs. Look at them today. This is what we know. There can be at best, two National Collegiate Hockey Conference teams in the Frozen Four. I will save you the conspiracy theory. There’s no black helicopter landing in Fargo. Here are some of the themes and stats surrounding this regional. In the West Regional, we have St. Cloud State 30-5-3, Ohio State 20-10-5, Denver 22-11-5 and American International 22-16-1. 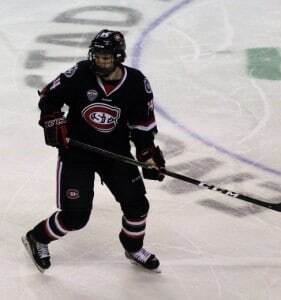 The biggest question, can SCSU finally advance to the Frozen Four. Last season, the Huskies were unceremoniously bounced by the Air Force Academy Falcons. With that in mind, this season, I am picking Ohio State University to advance from the West Regional. I look forward to hearing how wrong I am at the end of the weekend. This afternoon, I took look at the statistics and on paper, the Huskies should run American International right out of the building. Yes, see last season’s, Air Force team that shocked SCSU 4-1 in the first round of the West Regional. Obviously, the games aren’t played on paper, but this could end up being a really onesided affair. However, with that said, no one will complain if I am able to pen the title “Yellow Jackets Sting Huskies”. If the Huskies have a weakness, it’s their goaltending. The game between the Buckeyes and the Pioneers could end up being a goaltending battle. Both teams feature outstanding goalies. For DU, it doesn’t matter which one plays. Both are very capable. Last weekend, Pioneers head coach David Carle said something that was very profound. West Regional preview: St. Cloud State, Denver, Ohio State, American International (USCHO.COM) Apparently, the writers at USCHO are also addressing the elephant in the room. Why they will not advance to Buffalo: St. Cloud has bowed out in the first round of the NCAA tournament each of the last two years. Last time, it was as the No. 1 overall seed against the Atlantic Hockey champion. For as good as St. Cloud State has been all season in putting together 30 wins, four of the Huskies’ five losses have happened since New Year’s. Now would be a bad time to pick up No. 6, and SCSU isn’t taking any chances. t didn’t get any better for the Tigers. At the 07:21 mark of the third period, Huskies defenseman Jack Ahcan would give the Huskies a 4-1 lead. For that to happen, the Fighting Hawks needs to win their first-round series in the National Collegiate Hockey Conference playoffs. It’s a tall order, but not impossible. Should be a fun weekend of hockey. Moving forward. Wednesday, the UND hockey started their journey to Denver, Colorado to take on the Pioneers in a best-of-three National Collegiate Hockey Conference playoff series. This is the first time in 17 years UND has been on the road for the first round of the playoffs. That trip has started off with a hitch. On Wednesday, the Denver International Airport was closed. So, change of plans. UND decided to fly to Albuquerque, NM, and bus to Denver. Yes, the team has made it safely to the great state of Colorado. UND hockey fans are in unchartered waters. If you don’t believe me. From this week’s UND game notes — North Dakota is playing on the road in the first round of the conference playoffs for the first time since the 2001-02 season. Breaking a string of 16 straight years in which UND hosted the opening round. During that impressive run, UND compiled up an impressive 32-6 (.842) mark. Including a 10-1 (.909) mark in the NCHC. UND won all 16 of those series. What’s even more daunting, UND hasn’t swept in Denver in Denver since November 21-22, 2003. In the last 10 games, UND is 3-4-3 (.450) against the Pioneers. This season, UND is 10-8-1 against ranked teams and 8-7-1 that aren’t ranked. In the last 10 games UND played in, eight were against teams ahead of them in the NCHC standings. 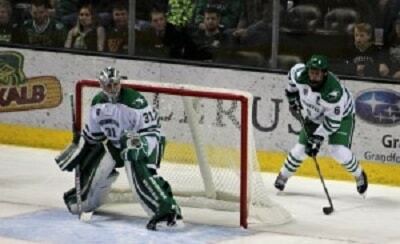 During the last 10 games, UND was 5-4-1 (.550). As I noted earlier, this team likes playing against the teams ahead of them in the standings and the USCHO rankings. With that said, the Fighting Hawks are ready for a tough challenge. UND’s problems are well documented. On January 4-5, 2019, UND lost a pair of non-conference games (1-3 L, 1-2 L) to the Canisius College Golden Griffins. That series has put UND is in Pairwise jail. If UND had won one of those games, they’d be 14th in the Pairwise Rankings. If they’d swept Canisius they’d currently be sitting in eighth place. Moving forward, it’s pretty clear what has to happen for UND to advance to the NCAA playoffs. Just Win. UND’s captain, junior defenseman Colton Poolman laid out what has to happen for the Fighting Hawks season to continue. It’s pretty simple, right? On Thursday, the NCHC announced it’s finalists for the 10 individual awards for the 2018-19 season. Last night in front of a strong crowd braving the elements at Ralph Engelstad Arena we saw a microcosm of the University of North Dakota’s season in one game. When this team starts fast, they typically do well. Nick Jones, senior forward playing on senior night, took a cross-ice feed from Rhett Gardner and wired home the opening salvo of the night 37 seconds into the game. Later in the period, Omaha forward Tyler Weiss banged home a loose puck in the crease with the majority of skaters sharing time and space with Peter Thome to tie it up. In the second, Jordan Kawaguchi made his first contribution to the box score taking a cross-checking penalty. Zach Jordan made UND pay for that mistake with a sensational release on a wrist shot to stake the Mavericks to their only lead of the evening. That lead would last 5:51 as Kawaguchi would return to the box score, this time to the good converting a power play marker on a Nick Jones feed. The third is where everything happened.Cole Smith converted the only really “soft” goal of the evening against Omaha netminder Evan Weninger who played an otherwise stellar evening. He finished with 41 saves on 46 shots. After a Gavin Hain tally gave UND a two goal lead, the Mavericks rallied back to tie things up with tallies from Nate Knopke and Tristan Keck. The Keck marker came off a Kawaguchi turnover with an extra attacker. Kawaguchi made up for it with a clean shot past Weninger 16 seconds into overtime. He is UND’s leading goal scorer after the regular season with only ten goals. 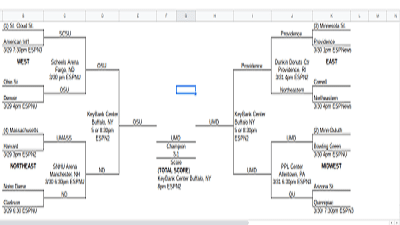 For Nebraska Omaha, if they can some how find a way to hold Duluth down a bit defensively than the expected result may be a little harder for the Bulldogs to achieve in the first round. The Mavericks showed this weekend that they do not need much time or space to have a chance with their quick transition game and Weninger’s ability in net. As for UND, this weekend did result in two wins pushing the Fighting Hawks closer to the NCAA Tournament. That said, this team still has things to clean up. Every week this team seems to take some undisciplined penalties that skew their rhythm and force them to alter what Head Coach Brad Berry likes to do, getting everyone involved in the game. This team has also dealt with a lot of injuries over the course of the season and is closer to being healthy with the return of Grant Mismash on Friday in limited minutes, and the return of Nick Jones. The most consistent line for this team this year is the GMC line of Gavin Hain, Mark Senden, and Cole Smith. Brad Berry did not have the option to deploy this line to shutdown the game at the end of regulation because Cole Smith was given a ten minute misconduct for involvement in a fracas with UNO 13:30 into the third period. Puck possession is this team’s strength, and even when healthy, as this weekend showed, they cannot take undisciplined penalties and need to find ways to stay ahead in games. Credit the seniors for playing well on senior night. Now UND has to take on a fast Denver team and take the series on the road to stay in the NCAA Tournament hunt. On Saturday night, the University of North Dakota hockey team honored five seniors from the class of 2019. When the night was over, those five seniors had played their final game at Ralph Engelstad Arena. There are no more home games for the class of 2019. 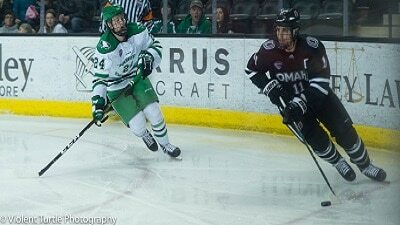 Next weekend, UND is headed to Denver, Colorado, to take on the Denver Pioneers in the first round of the National Collegiate Hockey Conference playoffs. This will be the first time in 17 seasons, UND has played on the road for the first round of the conference playoffs. Make no mistake about it, the Fighting Hawks need wins or their season is over. They need two wins in Denver to advance to the Frozen Faceoff. Then they’ll probably need to win a game at the Frozen Faceoff to advance to the NCAA West regional they’re hosting in Fargo, ND. To start the 2015-16 season, 11 players began their journey at UND. In the fall of 2015 Mike Gornall, Brock Boeser, Shane Gersich, Joel Janatuinen, Hayden Shaw, Matej Tomek, Ryan Anderson, Christian Wolanin, Rhett Gardner Danys Chartrand, Chris Wilkie arrived on campus. Today, four of those 11 players remain (Anderson, Gardner, Janatuinen, Shaw). Senior Nick Jones transferred in from Ohio State two seasons ago and is the fifth member of this season’s senior class. On Saturday night, to honor the senior class, UND head coach Brad Berry put all of the seniors on the ice for the game’s opening faceoff. Thirty-seven seconds later, senior Nick Jones scored the game’s first goal. It didn’t take long for that line to develop some chemistry. After their opening shift, the coaching staff kept that line together. At the 14:58 mark of the first period, the Omaha Mavericks would answer with a goal from Tyler Weiss. In the second period, Zach Jordan would score on the power play to give the Mavericks a 2-1 lead. At the 09:17 mark of the second period, sophomore forward Jordan Kawaguchi would score his first of two goals to tie the game at 2-2. In the third period, the Hawks would take a 4-2 lead with goals from Cole Smith and Gavin Hain. From there, things would get testy. There was a scrum in the Omaha end and then UND got into penalty trouble. When it was all said and done, Smith ended up with a two-minute roughing penalty and a 10-minute misconduct. That lapse in discipline ended up costing UND. The Mavericks would tie the game with goals from Nate Knoepke and Tristan Keck. Those penalties didn’t sit well with the UND coaching staff. After three periods, the game was tied 4-4. The overtime period didn’t last long. Sixteen seconds into overtime, Jordan Kawaguchi made up for a previous mistake by scoring the game-winning goal. Grand Forks Herald hockey beat writer Brad Schlossman had an interesting tidbit in his Saturday morning blog post. UND has scored in the opening four minutes in 6 of the last 18 games (a third of them). The Fighting Hawks are 6-0 in those games. After Saturday’s quick start, you can make that 7-0. Since taking the net on February 22, 2019, sophomore goalie Peter Thome is (4-2-0, 2.02 GAA and a .915 save percentage). Coming into this one, the setup for the Fighting Hawks of North Dakota could not have been more simple. Win two games against the Mavericks of Nebraska Omaha this weekend and hope for some help from Miami (OH) against Western Michigan this weekend. One of those things happened as UND earned a 2-1 hard-fought victory over the Mavericks of Nebraska Omaha. On Friday night, not only did Western Michigan ensure UND’s home ice streak for the first round of the playoffs would end.Now the Fighting Hawks will be on the road next week for the first round of the conference tournament for the first time since 2002. The Mavericks of Nebraska Omaha almost battled past UND and featured another stellar performance by netminder extraordinaire, Evan Weninger. He made 38 saves on 40 shots faced on the night and could have taken home star honors for his play. As for scoring on the night, Gabe Bast started the scoring soiree with a sublime wrap around to pot one past Weninger 3:45 into the first. Following the Bast salvo, things would remain quiet until Zach Jordan buried a five-on-three marker on a cross ice feed against Peter Thome. UND Head Coach Brad Berry noted that Thome would have liked to have made that play laterally, but he did not have much of a chance. Jordan hides a howitzer of his quite well and uses it to his advantage. All though he is not on the level, ask how many goalies are able to stop an Alex Ovechkin cannon from that spot, the answer of course is very few, even on their best day. Then finally in a third period that saw Rhett Gardner benched for taking two terrible penalties, Nick Jones came back to the lineup and tipped home a Colton Poolman shot on a draw Jones himself won. If centers could get two assists on their same play, the goal would read Jones from Poolman and Jones. UND needs to play more disciplined. The Fighting Hawks were,arguably, one non call on Jacob Bernard-Docker as he did knee Tristan Keck with the puck having left the area, away from losing their best defender and having to play with five defenders. The Fighting Hawks need to get better at two things for their home finale. First, maintain better discipline and make UNO drive 200 feet to get a good chance on you. Their only goal came on a power play that occurred because of two fast penalties that did not need to be taken. As for the Mavericks, protect Evan Weninger because he is a treasure to be better guarded than he has been this season. He made 38 saves but was under consistent duress all night and made plenty of grade-a stops to burnish his impressive career mix tape. Same two teams wrap up their regular season Saturday from the Ralph at 7:07 PM, how this one starts and how many penalties UND takes will determine who wins. This season, I’ve read a lot of comments about the makeup of the University of North Dakota hockey team. While this season hasn’t been as successful, there were still many amazing moments and storylines. Some younger players have taken big steps forward and next season should make a bigger impact on the team. Just for the record, this season’s team isn’t all coach Berry’s recruits. Some of the current players committed under former head coach Dave Hakstol. Stick tap to Brad Schlossman, he broke down the current players and who they committed under. Coach Berry had a big hand in recruiting the 2016 NCAA title team and this weekend UND will honor four remaining players from that historic team. Based on where UND is currently sitting in the standings. More than likely, this will be last home series of the 2018-19 season. To get home ice, UND needs a lot of help. The Fighting Hawks are four points behind the Broncos. Basically, they need Western Michigan to get swept. UND also needs to sweep the Mavericks. Both scenarios are possible, but not likely. I am not doubting that UND can sweep UNO, they’re not a very good hockey team. But, Western Michigan isn’t going to get swept by the RedHawks, they’re a gigantic dumpster fire. During the Wednesday media day, there was some discussion about the senior class and how big the incoming freshman class was during the 2015-16 season. There were 11 players. Four of them remain. Could you imagine if that class had stayed in tack? Mike Gornall – Transferred to RPI. Brock Boeser – NHL Vancouver. Shane Gersich – NHL/AHL Washington. Joel Janatuinen – with team, undisclosed ailment. Hayden Shaw – Still with the team. Matej Tomek – Transferred to UNO. Ryan Anderson – Still with the team. Christian Wolanin – NHL/AHL Ottawa. Rhett Gardner – Still with the team. Danys Chartrand – Left team, never played a game in two seasons. Chris Wilkie – Transferred to CC. Senior Nick Jones transferred in from Ohio State two seasons ago and is the fifth member of this season’s senior class.